During these cold winter months, we hope to warm your heart with a sailing story from this past fall. This story is about a young girl, Bontu, who arrived in Minnesota six months ago from Ethiopia, the only Oromo speaking girl in 6th grade in a predominately Somali school. Three months ago, on a September morning, she sailed for the first time during a field trip to LCSS. To help us create more stories like Bontu's, we ask you to consider donating either time or money to the Sailing School this coming year. Your efforts will support outreach to the thousands of kids and adults in the Twin Cities who need to experience sailing for the first time. Thank you, now onto the story. Bontu’s classmates, like Bontu herself, arrived in Minnesota in the past six months. All are students of "NABAD,” a group of middle school aged newcomers in a Minneapolis public school. The group totaled thirteen, two teachers, one teachers-aid/translator, and ten NABAD students. We spent the morning learning how to read maps of the lake and use a compass before setting sail in a fresh 10-knot breeze from the South. It was a sunny and warm early fall morning, the kind that reminds you more of summer than fall. Divided between two boats, we raced back and forth across the lake for the next two hours, taking turns pulling sheets, helming and playfully taunting the competition. We were on our way back to the dock, heeled up at 15 degrees, when I noticed Bontu leaning over the rail. I handed the tiller to Mahmoud; although it was his first time sailing as well, he was a natural skipper. I looked over the side and saw Bontu, her face right along the surface of the water. She sat up and smiled, her eyes looking at me, blinking under drops of lake water. 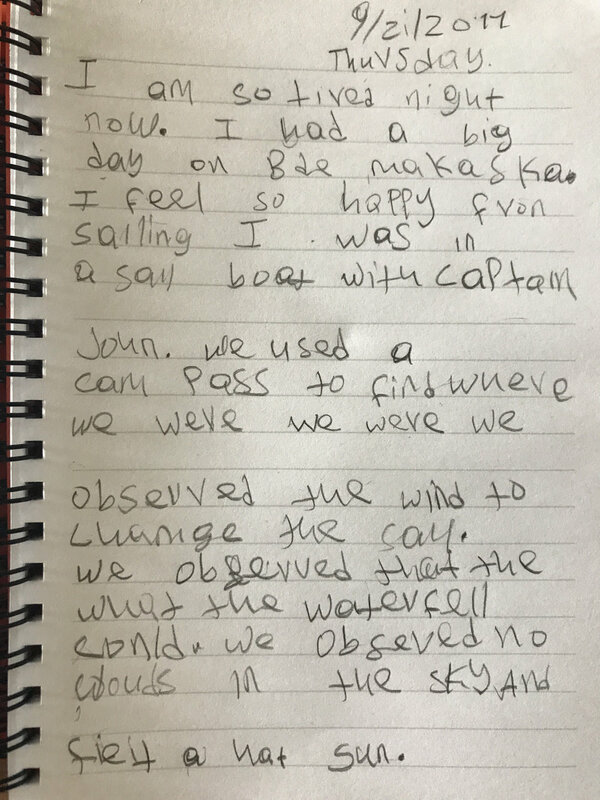 I saw a child enraptured in her experience of sailing, the force of the wind, the sounds of wavelets lapping against the hull, the smell of fish and seaweed, the taste of the water as it splashed on her lips. Every sense was engaged in the joy of sailing, leaving no room for the fears, distractions and hustle of day-to-day life. To create more outreach opportunities we need your help! If every Member donated $50 we could bring a new Ensign keel boat to the Lake next summer. With more Ensigns, we can expand outreach to larger groups of students and adults. We also need volunteers who can bring youth and adult groups out on sailing excursions. Please consider committing to volunteer this coming summer here. For the first time this offseason, we are offering boat repair classes followed by open shop hours when Members can volunteer to help work on our fleet of sailboats to get it in ship-shape. Look for upcoming announcements with the class dates and times. Thank you and happy sailing!